What can I do to treat my Achilles tendon pain? Reduce activities that aggravate symptoms and avoid wearing tight shoes that cause direct pressure on the tendon. 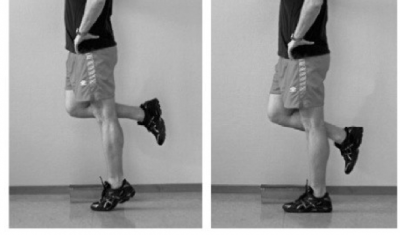 Using a heel raise within your shoe may also help reduce load on the Achilles tendon as a short-term measure. While anti-inflammatory medication (NSAIDs), such as ibuprofen and icing the area can be helpful to treat symptoms in the acute phase, they are not recommended in the longer term. Stretching and strengthening exercises once the pain has settled to improve the load capacity of the muscle and tendon. The type of exercises is dependent on the location of pain in the Achilles tendon (see below). Extracorporeal shock-wave therapy (ESWT) pass acoustic shockwaves through the skin to the affected tissue to help speed up your body’s healing process. Orthoses may be prescribed to address poor biomechanics. You should expect symptoms to improve after 12 weeks of treatment. Achilles tendonitis is an inflammation of the Achilles tendon that is typically short-lived. Achilles tendinosis is a degeneration of the tendon that develops gradually over time. The tendon loses its organised structure and is likely to develop microscopic tears. 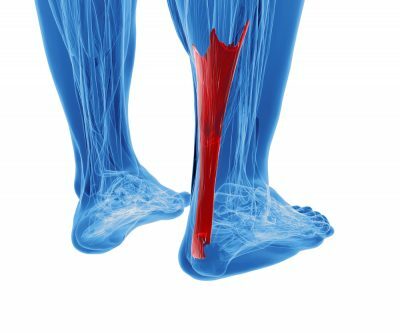 Achilles tendonitis/ tendinosis are caused by “overuse” such as doing too much too soon, sudden increase in activity or poor training technique. Discomfort, aching or stiffness within the tendon which may occur anywhere along the tendon pathway, from its attachment at the heel bone up to region just below the calf muscle. Pain often occurs first thing in the morning or after periods of rest, then improves with motion but later worsens with increased activity. Tenderness or pain when the sides of the tendon are squeezed. There is however, less tenderness, when pressing directly on the back of the tendon. Nodules or thickening in the tendon where the tissue is damaged. 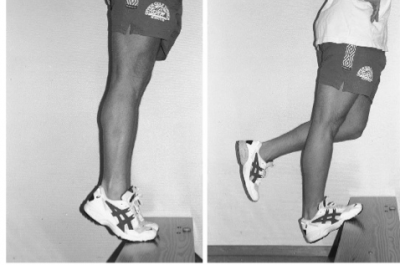 Eccentric loading exercises are shown to be the most effective way to stimulate Achilles tendon healing. Eccentric exercises are performed by contracting the muscle tendon unit, while also providing a lengthening force. Mid-portion Achilles tendinosis is pain in the mid-portion of the Achilles tendon (2-6cm up from the heel bone). For this type of tendinosis, you should focus slow heel drops on a step. Insertional Achilles tendinosis occurs at the heel bone where the tendon attaches. A key difference for this type of Achilles tendon pain is to avoid end range dorsiflexion (upward movement of the foot), such as walking uphill and doing heel drops. Instead, start on tip toes then slowly lower to floor level. Most will need to start by doing the exercise using both legs as it may be too sore to do the exercise on one foot. Start with low reps and sets, for example 5 reps 3 times on both legs and building up to 10 reps 3 times before progressing onto 5 reps 3 times on just your injured side. Be guided by your pain and gradually increase as you’re able to. Unlike many exercises it is usually ok to have some pain during eccentric loading. If you have injured your Achilles tendon or suffer with pain in the Achilles region which affects your participation in sport call Lilliput Health today on 01202 725 090 to speak to a member of our skilled Physiotherapy team for further advice. Will I cause more damage by doing exercises? There is no evidence that the tendon is at risk of rupture while doing these exercises. Gradual tendon loading activities are beneficial. Not enough or too much can be harmful. Any pain below 3 out of 10 on a visual analogue scale of 0 to 10 is acceptable but if the pain goes above 3, the activity should stop.